German rabbi and Hebrew journalist; born in Königsberg, Prussia, Sept. 7, 1819; died in Lyck, Prussia, March 15, 1882. His parents were Russians who settled in Königsberg when Jews were admitted to that city during the Napoleonic wars. 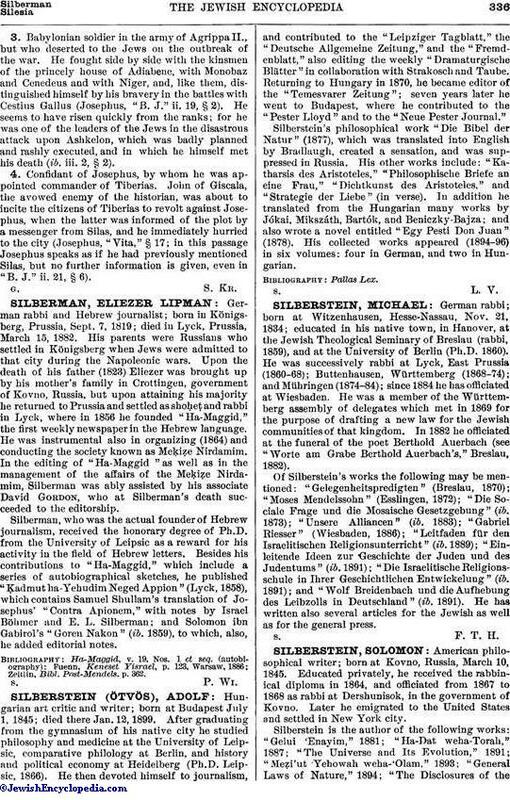 Upon the death of his father (1823) Eliezer was brought up by his mother's family in Crottingen, government of Kovno, Russia, but upon attaining his majority he returned to Prussia and settled as shoḥeṭ and rabbi in Lyck, where in 1856 he founded "Ha-Maggid," the first weekly newspaper in the Hebrew language. He was instrumental also in organizing (1864) and conducting the society known as Meḳiẓe Nirdamim. In the editing of "Ha-Maggid" as well as in the management of the affairs of the Meḳiẓe Nirdamim, Silberman was ably assisted by his associate David Gordon, who at Silberman's death succeeded to the editorship. Silberman, who was the actual founder of Hebrew journalism, received the honorary degree of Ph.D. from the University of Leipsic as a reward for his activity in the field of Hebrew letters. Besides his contributions to "Ha-Maggid," which include a series of autobiographical sketches, he published "Ḳadmut ha-Yehudim Neged Appion" (Lyck, 1858), which contains Samuel Shullam's translation of Josephus' "Contra Apionem," with notes by Israel Böhmer and E. L. Silberman; and Solomon ibn Gabirol's "Goren Nakon" (ib. 1859), to which, also, he added editorial notes. Zeitlin, Bibl. Post-Mendels, p. 362.